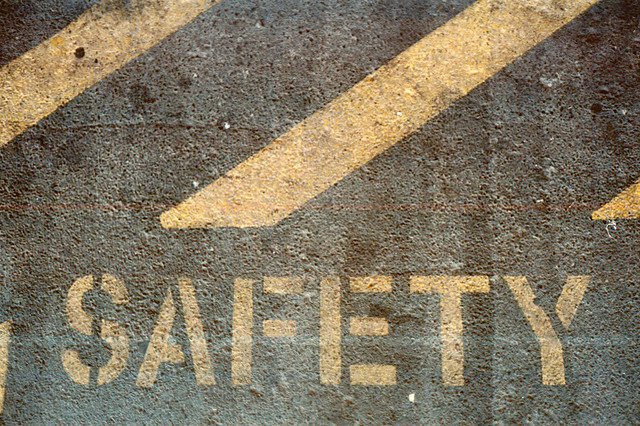 June, also known as National Safety Month, is quickly approaching. If you own or manage a business, now is the time to start planning safety training sessions, equipment upgrades and employee education classets to make your office a safer place. Read on for a breakdown of the month’s four weekly themes and some ideas about how to implement each of them in your workplace. Falling may seem like an unusual workplace occurrence, but falls account for both the majority of general industry accidents and 15 percent of all accidental deaths. Hold an employee education session in which you review the risk factors for falls and the strategies for staying safe. The major factors in most falls are: poor shoes or surfaces, human error and environmental factors, such as bad lighting or slippery floors. Of course, additional fall risks are present if your employees work at 4 feet above the ground in general industry or 6 feet above the ground in construction. Ensure these workers have received the most updated training and that their fall protection products are in good working condition. Spend this week encouraging your employees to live healthy lives. Strike a deal with a local gym and sponsor your staff’s memberships there. Appoint a wellness coordinator to post healthy recipes and exercise routines on a community bulletin board. Start a wellness library with workout DVDs, vegetarian cookbooks, pedometers and heart rate monitors and encourage employees to use these resources regularly. Create a culture of wellness by making this week the kick-off for a contest that rewards staff members for logging the most steps per day or the most minutes of exercise per week. Start this week by posting updated emergency exit maps in multiple places throughout your office space and have employees practice evacuating the building. Next, ensure your office heating, cooling and ventilation systems are in ideal conditions and are able to successfully filter contaminants. If you don’t already know how, learn to shut down these systems in the event of an emergency. Finally, be prepared for any eventuality, such as severe flooding, a blizzard or a tornado, that would force your employees to stay at work overnight. Buy a crank-powered radio and flashlight, bottled water and nonperishable food. Show your staff where these emergency supplies are stored and ask for a volunteer to update the goods every few months, throwing out any expired foods. You and your employees spend at least 40 hours a week in the office, so it’s important that your workspace contributes to your health. Inspect your office and ensure it’s ergonomically designed. Desks should be situated so that everything is within reach. Employees should never have to twist, turn or stretch to type or use the phone. Rearrange furniture or change the layout of your office to reduce your employees’ physical strain. If your staff spends a significant amount of time on the phone, train them to use headsets in order to avoid neck and upper back strain. National Safety Month is just around the corner, so it’s crucial you begin developing ideas and training sessions now. Spend each week focusing on the appropriate theme, from preventing slips, trips and falls to creating an ergonomic workspace. Soon, you’ll be working in a safer office with employees who appreciate your investment in their health and wellness.